Over the past year as Russia and the West have faced off over whose integration project Ukraine will join, China has been preparing a third way forward. When a year ago Crimea became part of the Russian Federation, many said that this was the Rubicon not only for Russian politics, but for the entire world order. Moscow showed the West a real red line, whose crossing would produce real consequences. Moscow’s message to the West was that there could be no stopping now - the prestige and authority of great powers were at stake. Since then, there has been an extremely full year, and an entire series of events must be commented on. First of all, political motivation prevailed over economic expediency. No matter how you evaluate the decisions made in Russia and in the West since Spring 2014, it is clear that economic costs were considered secondarily. Other criteria, such as security, the need to uphold strategic positions and national dignity, drove the decision-making. In the case of Crimea, Moscow raised anew the issue of national sovereignty. In the 1990s and the early 2000s, many analysts nurtured the illusion that the process of globalization would bring about the end of the sovereign nation-state system. Crimea shattered these dreams. But, as a result of these integration processes, a state can no longer protect its territory from external influences – whether these be economic, ideological or cultural. And when internal problems cannot be managed effectively, they collide with these external impulses, with disastrous consequences. The situation in Ukraine is a vivid example. What will be the new status quo? A year after Crimea was integrated into the Russian Federation the balance of power in the world has changing, although there is no established new status quo. The nature of relations between Russia and the European Union has changed, and most likely irrevocably. The model that was called "strategic partnership" lasted for two and a half decades. In it, Russia and the EU intended to build a "Big Europe," which called on a certain form of economic and normative integration. The perception changed with time, and the initial enthusiasm turned into realism, and then even into skepticism, but no one ever rejected the objective – until the Ukraine crisis. Even if the situation stabilizes, there will be no return to the former relationship. Mutual trust has been undermined – trust that had been in a state of inertia since the early 2000s. It is also necessary to understand that the cancellation of formal sanctions when it happens will not immediately remove all the barriers they constructed. Political and economic institutions have the necessary tools to continue to enforce them informally. After Ukraine, Russia and the EU will need to fine a new way of dealing with each other. Transatlantic relations are also changing. In the rounds of talks to deal with the Russian threat, we are witnessing the attempt to resurrect the consolidated West the way it was during the Cold War, both through the reanimation of NATO and the creation of powerful economic blocs under the aegis of the U.S. The U.S. is working to build the Trans-Pacific Partnership and the Transatlantic Trade and Investment Partnership; the first is unlikely to work, but the second is possible. These processes of consolidation may not succeed, but it is clear that the West is trying to achieve cohesion after a period of gradual loosening of unity. The most unexpected result of the crisis in Ukraine is the emergence of China as a leading Eurasian power. As Russia and the West clashed over whose integration project Ukraine will join, Beijing announced a completely different initiative, although one aimed at that geographical area. 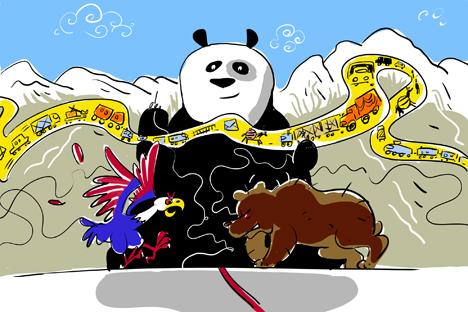 It is symbolic that Chinese President Xi Jinping's initiative to create the Silk Road Economic Belt was announced precisely at the time – Fall 2013 – when Russia and the EU where reaching the culmination of their confrontation on Ukraine. With the Silk Road Economic Belt, China is noticeably distancing itself from any competition, proposing a project that bypasses all others and may even absorb them. With the volume of resources that Beijing is capable of investing, it is impossible for anyone to compete. While Russia, the EU and the U.S. are operating in Eurasia mainly with political instruments that are creating friction, China is offering real money – and political neutrality. The emergence of China as the leading Eurasian power is the result of the Ukrainian crisis that is likely to have the most impact on Russia, the European Union and the United States. Moscow’s challenge to the U.S. is a high-stakes game neither side can lose.